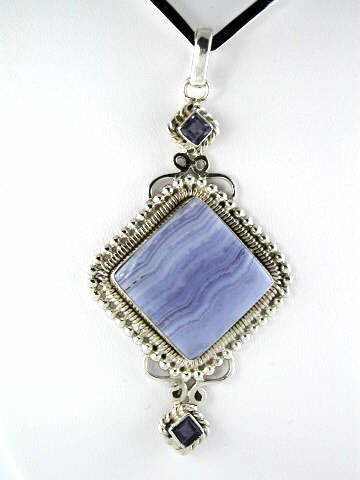 Large, beautiful and eye-catching, this splendid Blue Lace Agate pendant is set with two, faceted, violet Iolite stones in 925 sterling silver. The trademark 'lace' banding is excellent. Blue Lace Agate has a beautiful, calm, healing energy. It is a lovely healing stone, using its gentle vibration to soothe and support the mind, body and spirit. When worn by a man it can help them express the more sensitive side of their nature thus bringing their yin side into balance. Its keywords are calmness, positivity, joyfulness and harmony and it aligns with the Throat chakra. This is one of the best examples we have found in quite some time.